Bar Harbor is a town on Mount Desert Island in Hancock County, Maine, United States. You'll explore the less-touristy side of things at Eagle Lake Acadia National Park and Beech Cliff Loop. Ship Harbor Nature Trail and St. Saviour's Church : will appeal to history buffs. Change things up with these side-trips from Bar Harbor: Southwest Harbor (Wonderland Trail & Perpendicular Trail) and Nervous Nellie's Jams and Jellies (in Deer Isle). And it doesn't end there: see the interesting displays at The Seal Cove Auto Museum, trek along Flying Mountain Hiking Trail, stroll through Heart of Acadia Loop, and get a dose of the wild on a nature and wildlife tour. For reviews, where to stay, photos, and more tourist information, use the Bar Harbor online trip itinerary builder . In May, daytime highs in Bar Harbor are 60°F, while nighttime lows are 43°F. Cap off your sightseeing on the 31st (Fri) early enough to travel back home. Kick off your visit on the 1st (Sat): take an in-depth tour of Wright Museum of WWII, contemplate the long history of Canterbury Shaker Village, and then visit a coastal fixture at Cape Neddick Nubble Lighthouse. On the 2nd (Sun), you'll have a packed day of sightseeing: look for gifts at Len Libby Chocolates, enjoy the sand and surf at Ogunquit Beach, and then get to know the fascinating history of Marginal Way Walkway. For maps, more things to do, ratings, and tourist information, use the Ogunquit travel itinerary planner . Drive from Bar Harbor to Ogunquit in 4 hours. Alternatively, you can do a combination of flight and bus; or do a combination of car, flight, and bus. 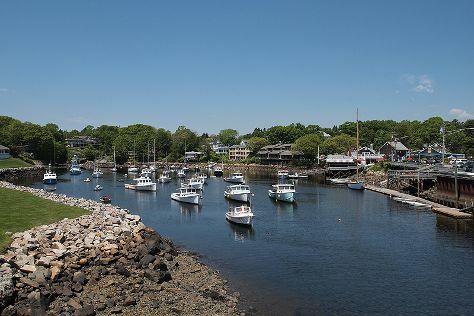 When traveling from Bar Harbor in May, plan for a bit warmer days in Ogunquit, with highs around 66°F, while nights are about the same with lows around 43°F. Wrap up your sightseeing by early afternoon on the 3rd (Mon) to allow enough time to drive back home.